Thank you George, fantastic instructor. I'm very happy to have passed with absolutely "no faults" in my driving test, so it's amazing, great lessons, great professional, experienced.110% Recommended. Thank you so much. Just passed my test today with zero faults! Thank you so much to Thames Driving School, especially George, who was the best instructor I could have asked for! I cannot recommend these guys enough. You have been fantastic! Thanks for everything George! Passed first time, great instructor who taught to a very high standard definitely recommended. Thank you Thames Driving School, so happy to pass my test first time. All down to a great instructor, very professional while still keeping things nice and relaxed, highly recommended! Here are just a few of the many reviews and testimonials we get here at Thames Driving School. All our reviews are honest and genuine and we have not filtered out any of the reviews. Please view our Google plus page and Facebook page to see that all these reviews are from genuine students that have passed their driving test with us. I found my experience with Thames Driving School to be very positive! My driving instructor was always on time and very patient with me, and I passed my driving test first time with only 2 minors!! So thumbs up from me! I would like to thank Thames Driving School for the excellent training for practical driving test. The driving instructor was highly professional, friendly and co-operative and the exercise was fun. I would highly recommend Thames Driving School. Learning to drive with Thames Driving School was the best decision I ever made. I had tried to learn to drive with other schools before and found them to be more expensive and felt they seemed to hold me back and not give me the same opportunity or experience level that my Thames Driving instructor did. I passed my driving test 1st time with only 4 minor faults and feel confident and qualified to drive independently. I have no hesitation in saying Thames driving school is the best available in the Twickenham and Richmond areas. I really enjoyed my driving lessons which were well structured and tailored to suit me. My driving instructor was very patient and helped to build my confidence as I developed my driving skills, encouraging me at every stage. I had lessons several years ago and never felt like I was making any progress, giving up before even taking the driving test. This time round it was a completely different learning experience, I felt at ease straight away and trusted my driving instructor. I felt thoroughly prepared for my driving test and was really pleased to pass first time! Having a really good driving teacher makes all the difference, and I would definitely recommend Thames Driving School if you want to be a safe and confident driver. This was my third driving school and my driving instructor made me feel relaxed enough to actually enjoy the lessons! I never imagined i would pass first time but thanks to my driving instructor's enormous patience, encouragement and professionalism I did, so I'm very happy. I would definitely recommend Thames Driving School to anyone. Thames driving school made me feel confident about my driving which lead me to pass first time, thanks to the support of my driving instructor. I am a mature person, mother of three. Thames driving school helped me to pass my driving test for the first time. My driving instructor is patient and very calm man who never looses his temper. He will always be my friend. Thanks to him, I will always check my blind spot! My first lesson, I was convinced and felt in right hands. I drive safe after passing the Pass Plus Driving Course! These instructors are excellent. Good experience. I had overcome my driving fears. Great Driving Instructor, Supportive, Positive and disciplinary. I have learnt at three different driving schools but Thames Driving School was easily the friendliest and the most efficient. I was very pleased to have passed my driving test the first time, thanks for the help and support I received throughout my driving lessons, very friendly and positive. Thames Driving School were great. They were very patient and understanding and helped me pass with ease! 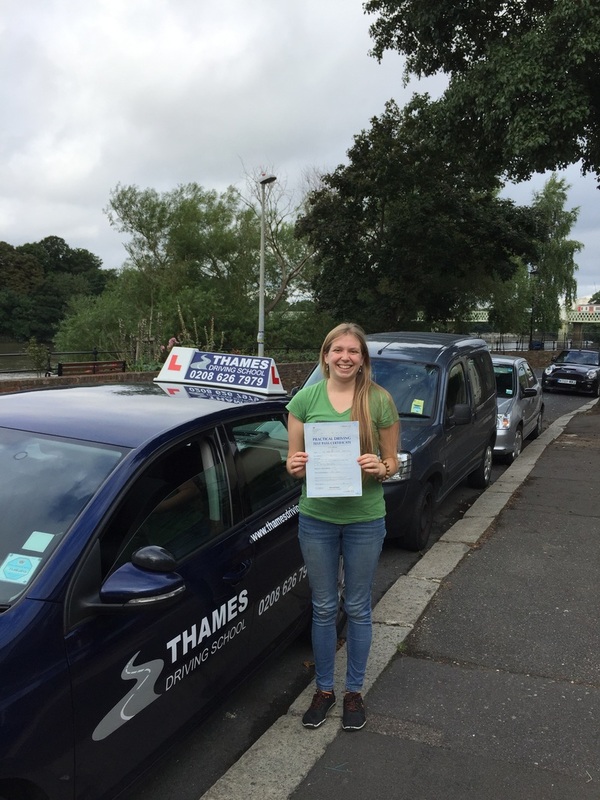 Thames driving school has enabled me to be a confident and safe driver because of the dedication and support from my driving instructor, making it possible to pass my driving test first time. Many Thanks. My name is Paul and I just have to say I REALLY ENJOYED my time at Thames Driving School. Having passed first time with ease I can't fault Thames Driving School. The level of service was OUTSTANDING and rare to find. My driving instructor and me have become great friends. Trust me, its a decision you WON'T REGRET. I never thought I would be able to pass my driving test first time but thanks to Thames Driving School I did! My instructor may be a perfectionist, which can be frustrating at times however you will definitely be thankful for it later when you are driving around remembering to always check your mirrors. He is patient and calm even when you still can't reverse around a corner on your tenth attempt! My instructor at Thames Driving School was very friendly and I PASSED MY DRIVING TEST FIRST TIME so I am very happy! Perfect for students, great price and even better teaching. Under a very friendly atmosphere I have become a confident and safe driver! Through the truly unforgettable driving lessons not only did I comfortably pass my driving test, but I made a true friend. An honest recommendation to all! The driving instructor was very friendly and i was very impressed with the thorough and professional nature of the driving lessons which prepared me perfectly for the driving test. I would highly recommend Thames Driving School. My instructor, Ray, was fantastic and helped me feel at ease and confident in my driving, not only for the test, but for the road in general. My instructor George was professional, experienced and relaxed. Not only does he teach you everything you need to know to pass the test but will also offer tips and constructive criticism of your's and OTHER road users' driving so that you will ..